Courses at the CEA Buenos Aires Center are designed in conjunction with, approved, and transcripted by our School of Record, the University of New Haven. UNH is regionally accredited by the New England Commission of Higher Education (NECHE), formerly known as the Commission on Institutions of Higher Education of the New England Association of Schools and Colleges, Inc (NEASC). The CEA Buenos Aires Center offers an interdisciplinary liberal arts and social sciences education in a cosmopolitan capital city. CEA courses turn the city into your classroom, thanks to courses in a wide range of liberal arts and social science subjects focused on Argentina and Latin America. The city of Buenos Aires provides a stimulating environment in which to study political, cultural, and business trends in Latin America. You’ll enjoy the opportunity to gain global competency and further your academic pursuits while immersed in a city that blends its European heritage with a modern Latin American style. Designed to explore the natural strengths of the city’s history, culture, and political environment, CEA Buenos Aires Center curriculum focuses on language, cultural studies, international relations, and business. Courses incorporate activities specifically designed to take the curriculum out of the classroom and into the community. Even outside of the classroom, you’re constantly encouraged to apply what you’ve learned by connecting subjects examined in class to the daily life of the host community. This ongoing, active, and reflective approach not only helps you gain a better historical and social understanding of Buenos Aires and Latin America, but also helps you develop the international cultural fluency required to communicate and function effectively in an increasingly globalized world. The mission of the CEA Buenos Aires Center is to provide you with the tools and direction you need to learn about Argentina and Latin America, and to allow you to critically reflect and articulate on your own national, cultural, and social identities. Faculty members at the CEA Buenos Aires Center are committed to fostering students’ intellectual and cultural growth by engaging them in lively simulated debates, multimedia research presentations, and round-table discussions. Courses taught at the CEA Buenos Aires Center have been designed in conjunction with and approved by the University of New Haven (UNH). Academics from other institutions, including the University of Florida and University of Arizona, also contributed expertise to the curriculum development process. Faculty appointments are approved by UNH. After the successful completion of a session at the CEA Buenos Aires Center, students will receive credit for their work from UNH. Classes are taught by local international faculty selected by CEA and approved by UNH. Faculty members represent a variety of academic and professional backgrounds. Attendance in all classes is mandatory and monitored by each instructor. Class size ranges between 15 and 25 students. Small class sizes allow for personalized attention from your instructors. Instructors at the CEA Buenos Aires Center carefully evaluate students’ work and progress throughout the academic session. When calculating grades, instructors consider written and oral exercises, homework assignments, attendance, classroom participation, and exam performance. The following grading system is in use at the CEA Buenos Aires Center. The University of Belgrano is recognized by the Argentine Ministry of Public Education as a degree-granting institution of higher learning. Since its founding in 1964, the University of Belgrano (UB) has grown into one of Argentina's leading higher education institutions. This private university offers a range of courses to a culturally diverse population of more than 14,500 students. More than 900 international students participate in exchange programs through the University of Belgrano each year. The campus, located in a distinguished residential area of metropolitan Buenos Aires, is just a few minutes from downtown and features modern facilities, computer labs, libraries, and cultural, artistic and athletic activities to complement academics. UB faculty instruct through the Programa de Estudios Argentinos y Latinoamericanos and other UB departments. CEA students have access to the same university facilities as Argentine students, allowing you to fully appreciate UB student life. By sharing the university campus with local and other international students, you’ll have the opportunity to meet and interact with your peers. Faculty from University of Belgrano teach your language courses and electives. Teaching styles in Argentina may differ from those in the U.S. Be prepared to adapt to different classroom structures and coursework expectations. Class size ranges between 10 and 15 students for language courses and between 10 and 40 students for electives. You may attend class with international students from the U.S., Europe, Canada, and other parts of the world. Love playing, watching, thinking about, studying (and even dreaming about) sports? 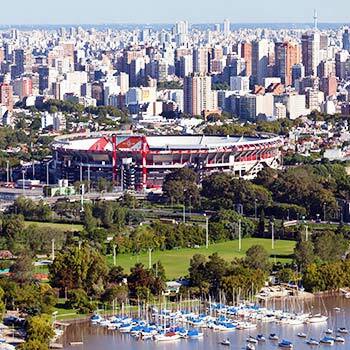 Bring your obsession to Buenos Aires, a city filled with super fans! In this program, you’ll delve into the national identity that thrives around Argentine sport culture and the significance of sports like soccer and polo. In addition, you’ll examine how sport fits into the politics and economics of Argentinian culture. You’ll meet professionals in fields like sport entrepreneurship. You’ll even gain practical business skills in event management and sport marketing as you experience community, regional, and national sporting events alongside locals.